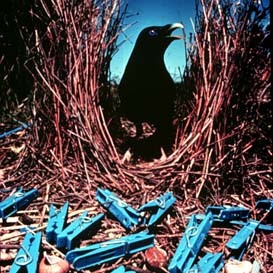 Writers are bowerbirds. We observe the world around us intently and are often found eavesdropping on other people’s conversations. When we come across something that piques our interest we snitch it when no one’s looking. My nest is my writer’s journal. I like to collect fragments of conversations that show aspects of character, or suggest possible conflict or plot. I’m always on the lookout for quirky words and phrases and the interesting ways people have of putting them together. Last week I came across Kenneth Fearing’s brilliant poem, Love, 20 cents the First Quarter Mile. When I stopped laughing, and also cringing at his appalling narrator, I wrote the poem in my journal because it’s a perfect example of great dramatic dialogue. The dialogue has purpose. It reveals character, moves the plot forward and supplies important information. Often it does all three at the same time. As in all great writing the reader is asked to form her own opinion about the characters and the situation. The tone of the poem suits the content. It’s highly conversational and there’s no jarring formality or stilted syntax. Here’s the poem. Enjoy it. This entry was posted in Uncategorized, Writing and tagged dialogue, Poetry, writing dialogue, writing skills. Bookmark the permalink. Karen I adore this poem and relate to it whole heartily, as I’m sure many can. Hi, Sue. I love the poem, too. The nature of the character has been portrayed so strongly I feel I know him very well. And I’m extremely glad I’m not in a relationship with him. Hi Karen, thanks for sharing that wonderful poem. I laughed out loud, as you said you did and i’m in awe of the talent of Kenneth Fearing for being able to portray so much in so few words. I love that it remains purely in his point of view and couldn’t help but imagine what she would be thinking. Hi Maree. I’m glad you enjoyed the poem as much as I did. I agree that the single point of view is brilliantly handled. Interestingly, I read the poem and expected her pov to be the same mine, but you don’t know, do you? Maybe I just hope she’ll bail out. Karen, I also love Kenneth Fearing’s poem, its somewhat black humour, and how much is revealed so cleverly. I’d love to know how she’d react to the narrator’s narcissistic overtures and his need to have the final word. Your blog though, has prompted me to start using my journal more consistently! Thank you so much for that. Hi Diana. I’m pleased you liked it. It might be fun to write a poem from her in reply. That way we are in no doubt about whether she falls for his non-apology apology or if she is wiser than that. Keeping a writer’s journal is necessary for me because I have such a bad memory. Thanks for commenting. Hi, Joanna. I’m glad you enjoyed the post. I appreciate your comments and they were as clear as a sunny day to me! Thanks for dropping by again. Thanks, Mr AnElephant. I’m glad you enjoyed the post. Elizabeth Taylor and Richard Burton to a T.
That attraction/repulsion relationship must have been very difficult to live in.